Espresso Caramel Brownie. Handmade by Cakesmiths. 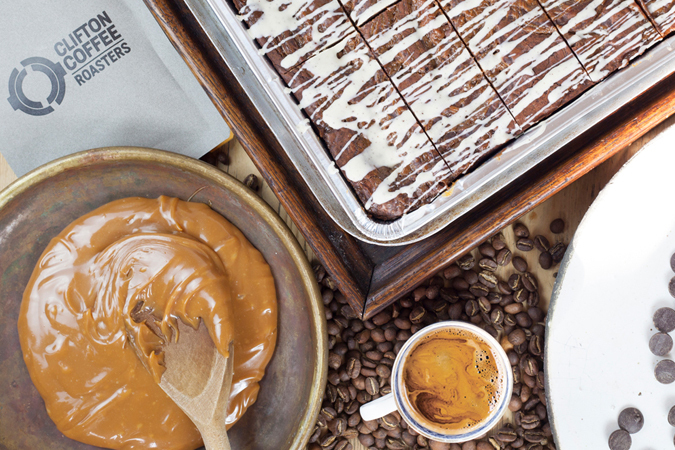 An intense espresso hit with Belgian chocolate and our signature gooey caramel. Made with a finely ground Ethiopian coffee Biftu Gudina. Kindly supplied by our friends at Clifton Coffee. Proudly supporting UK Coffee Week and Project Waterfall. 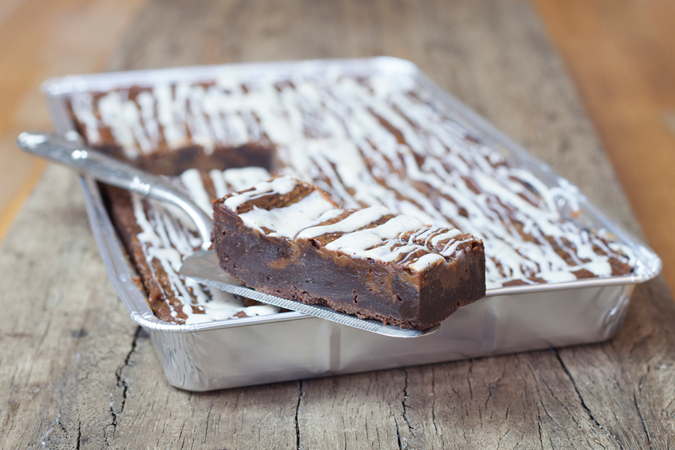 We'll be donating 50p for every Waterfall Cake tray sold. Why not sign up to UK Coffee Week and join the fun too. Espresso caramel (30.8%) (caramel (sweetened condensed milk (whole MILK, sugar), sugar, salted butter (MILK), golden syrup), water, coffee), sugar, coconut oil, dark chocolate ((cocoa mass, sugar, cocoa butter, SOYA lecithin, natural vanilla flavouring) min cocoa: 70.0%)), free-range EGG, flour blend (rice, potato, tapioca, maize, buckwheat), white chocolate (sugar, whole MILK powder, cocoa butter, skimmed MILK powder, SOYA lecithin, natural vanilla), reduced fat cocoa, coffee, water, salt, ground coffee.